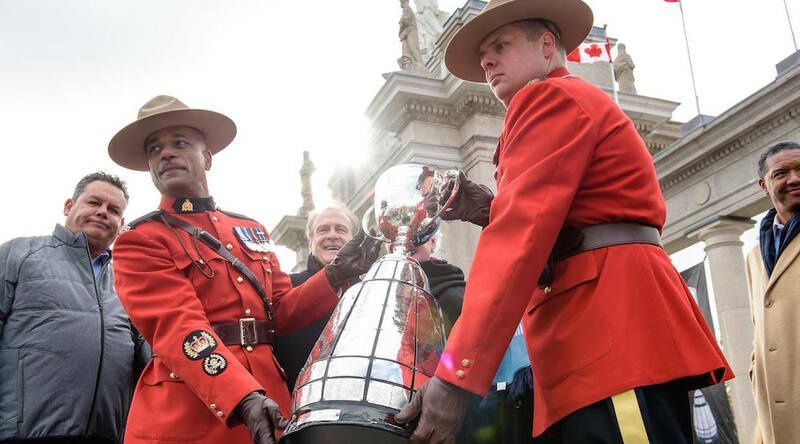 As the teams and media arrived in Toronto to start their preparations for the week, it comes as no surprise that the Calgary Stampeders are viewed as heavy favourites to take home the 104th edition of the Grey Cup. While the Stampeders had a chance to set a league record for points in a season, first-year head coach Dave Dickenson chose to rest his regulars during their last game of the regular season to send his team the message that their focus should be solely on the Grey Cup. And the message was received loud and clear by Dickenson’s well-rested team as they dismantled the BC Lions 42-15 in last week’s Western Final. For the REDBLACKS, the road to their second consecutive Grey Cup game was a little more uneven than expected. Ottawa did earn an Eastern Division title and first-round playoff bye with a 8-9-1 record, and managed to win the Eastern Final in a surprise snowstorm against the Edmonton Eskimos despite almost squandering a 22-point second half lead. Will the Stampeders crush the REDBLACKS as expected on their way to their eighth Grey Cup victory in franchise history? Or will Ottawa give them a run for their money the likes of which the city of Ottawa hasn’t seen since Tony Gabriel’s last game in 1981? 1. Can the Stampeders offence be stopped? The Calgary Stampeders defence is great in its own right, but the strength of this team lies on the offensive side of the football. Led by 2016 Most Outstanding Player nominee Bo Levi Mitchell, not only did the team lead the league in scoring, they excel in the areas that win you football games. The Stamps led the league in time of possession, turned the ball over the least amount of times, and allowed the fewest quarterback sacks. When you do those key things, have an absolute hammer at running back in Jerome Messam, and a deep, diverse and dangerous receiving corps featuring rookie DaVaris Daniels, your offence will keep REDBLACKS head coach Rick Campbell up at night this week leading up to the big game. A lot of ink has been spilled over the years about the schizophrenic play of REDBLACKS quarterback Henry Burris on a game-to-game basis which eventually led to his departure after seven seasons in Calgary. But since his return to the starting lineup late in the season, Burris has been a steady veteran presence in the pocket for a team that still has great depth at receiver with Ernest Jackson, Greg Ellingson, and Brad Sinopoli despite losing their top threat Chris Williams to a major knee injury earlier in the season. The REDBLACKS are going to need a seminal performance from Good Hank if they want to have a shot at taking the Grey Cup back to the nation’s capital. Not that the Stamps need it, but they don’t have to look far for inspiration. The late-September tragic shooting death of 23-year-old Stampeders defensive back Mylan Hicks outside the Marquee Beer Market has weighed heavily on the minds of his teammates and coaching staff. It was an emotional moment last weekend when Jamar Wall, who changed his jersey to #31 in Hicks’ honour, intercepted a pass and returned in for a touchdown to give the team a 31-0 lead in the Western Final. The team would like nothing more than to win the biggest game of the year in his honour and take the Grey Cup to Michigan for a visit at his alma mater in East Lansing. While many elements of the Grey Cup and this week have been well thought out and organized, one issue that has persisted is the issue with attendance for the main event. The hosts seemed to have really dropped the ball with regards to its ticket pricing structure and did their best to remedy the situation by issuing refunds to initial ticket purchasers after reducing prices when they grossly misread the local market. Rumours of Bell Media employees being offered as many as five free tickets to the game in an effort to save face and paper BMO Field with a sellout seem to be lingering around. So, it will be interesting to see what the attendance is like for a game that isn’t considered to be an intriguing match-up in a market that is lukewarm for the CFL product at best. Perhaps fans from Ottawa and Calgary travel well, as it was announced on Wednesday that just 2,000 tickets remain for the game on Sunday. Less than 2,000 tickets remain for this year's #Greycup in Toronto. Hopefully for everyone’s sake, Toronto finds a way to fill BMO. For the first time since 1982, the city of Toronto will host the Grey Cup outdoors, so there is a chance the weather could become a factor for the players and fans alike. Luckily for everyone, the weather forecast for Sunday doesn’t look to be too treacherous, with a high of around 3° Celsius at game time that feels more like 0° Celsius. But if we know anything about November weather in Canada, it is to expect the unexpected. When you look at all the statistics, storylines and recent history, the 104th edition of the Grey Cup shouldn’t be a close one. The Stampeders are heavy favourites for a reason as they look to win their 2nd championship in three seasons. With that said, the Grey Cup has a way of bringing out the best in an underdog opponent much like it did in 2014 when the Stampeders were a clean Taylor Reed block away from a loss. So, look for REDBLACKS head coach Rick Campbell to pull out all the stops on offence, defence, and special teams as they try to get up early and put some pressure on first-year head coach Dave Dickenson’s team. It’s easier said than done, but if Ottawa can win the turnover battle and make Calgary one-dimensional by getting an early lead forcing the Stampeders to abandon the run, they will have a chance to stick around and maybe pull off a stunning upset. But if the REDBLACKS fail to generate any turnovers or pressure on Bo Levi Mitchell, this game could get out of hand in a hurry and the Grey Cup will be on a charter to Calgary early Monday morning.